Supported by Shahid Bhagat Singh Research Committee, Ludhiana, this website makes available the original photos and documents of Shaheed Bhagat Singh and his compatriots, and the Indian Independence Struggle. The website will be updated on regular basis, you are invited to revisit and also give your feedback. Sukant Chandan is an analyst and journalist specialising in Third World studies. He has contributed to Al-Ahram Weekly and Monthly Review amongst other publications. He is the editor of the website of the Organisation to Understand Radical Arab and Islamist Movements (OURAIM). Kanwal Dhaliwal (born 1960, East Punjab) belongs to the second generation of post-Partition painters. Working in all the mediums he, unlike his predecessors Amrita Shergil on the one hand and Sobha Singh on the other, paints the Punjabi landscape and its people in an unsentimental way. Diwan Manna has been actively capturing/creating images in India, Europe, America and South East Asia since 1980. Trained as a graphic artist and painter, he chose to become a conceptual photographer. He has received many awards and honours including the National Academy Award by the National Fine Arts Academy of India. Shahid Mirza is a painter, he founded and runs the Lahore Chitrkar studio & gallery since 2001, conducts a drawing and painting portfolio class and occasionally writes art reviews. Fauzia Rafiq is a Pakistani Canadian writer of fiction and poetry who writes both in English and Punjabi. Her novel Skeena was published in Punjabi (Arabic Script) by Sanjh Publications in Lahore in May 2007. She has begun a communal blog to discuss Punjabi literature, authors and publishers at http://uddari.wordpress.com/. Ajmer Rode writes in English and Punjabi and has published books of poetry, plays non-fiction and translations. He has been an active member of The Writers Union of Canada and Vancouver Punjabi Writers Forum, and is a founding member of several Indo Canadian literary and performing arts associations in Vancouver where he currently lives. Poet Owen Sheers has just published his first novel "Resistance" (UK Faber, 2007/ US Nan Talese/Doubleday 2008). His collaboration with composer Rachel Portman, The Water Diviners Tale, an oratorio for children, was premiered at the Royal Albert Hall for the BBC Proms 2007. Owen is currently a Dorothy and Lewis B. Cullman Fellow at the NY Public Library. Sidharths philosophy is back to roots in synergy with changing times. There are four major strands that seem to influence his creative outpourings and oeuvre. One can see a clear play of folk culture, history and traditional techniques. A meditative streak and study of classical texts is also evident in much of his work. Bhai Baldeep Singh was given the Ustad Bhai Batan Singh Memorial Award for his contributions to the revival of kirtan. He was honoured by Delhi State in 2003, and the same year he was conferred the "Sikh Gaurav" Award in Amritsar. Bhai released his first solo CD album "Jori" in 2004. All through his life in art, Prem Singh has always gone back to nature, not for fresh pictorial idioms only, but to trace the Unmanifest beyond the world of senses. The paradox that his paintings present to us is that it is only through the sense perception of the familiar that we get intimations of the Unmanifest. 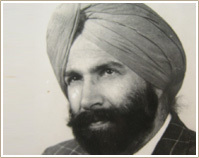 Kulwant Singh Virk is a pioneer of contemporary Punjabi literature. In 1958, Virk won his first award for his collection of short stories DUDH DA CHAPPAR (A Pond of Milk); the Indian National Sahitya Academy Award in 1968 for his short story compilation NAVE LOK (New folks); he was recognized by the Literary Forum of Canada in 1984, and acclaimed for his contribution to literature by the Punjab Sahitya Academy in 1986.